Southern Utah’s Grand Staircase-Escalante National Monument may have originally safeguarded untapped troves of ancient fossils, but the Trump administration’s unprecedented reduction of the monument has exposed vast deposits of these scientific treasures to potential energy development. Areas removed from the Staircase are nearly as rich in fossils as those that remain, according to an analysis by the Wilderness Society. The Bureau of Land Management is accepting public comment through Nov. 30 on its draft plans for the reduced monument and lands pulled from the previous 1.9 million-acre Staircase. The 1 million acres in the shrunken monument will remain off-limits to mineral development. But in deference to President Donald Trump’s “energy dominance” agenda for public lands, the BLM’s preferred alternative prioritizes energy extraction on much of the 900,000 acres taken out. Areas categorized as “very high” for fossil yield potential were largely left inside the reduced monument boundaries. But nearly half the 900,000 acres culled from the monument still hold a high potential for fossils, and nearly 250,000 of these acres overlap with lands that could be pegged for mineral development. The greatest degree of overlap occurs in upper Alvey Wash, south of Escalante, an area once blanketed with oil and gas leases, and the Smoky Mountain area northeast of Big Water, once proposed for a coal mine. A BLM spokeswoman was not able to immediately comment Wednesday, but the agency has previously stressed a commitment to protect ecological and geologic resources while opening places for mining and drilling. For any new project, site specific analyses would be required to identify the optimal places to dig and drill, officials say. Critics, however, fear the BLM can’t really know whether a specific project would wreck fossils until after rigs bore into the ground in search of minerals and turn up bones. Few of these lands have been surveyed for fossils, which are largely invisible to the untrained eye. The BLM data analyzed by the Wilderness Society simply identify the level of potential that lands have to yield fossils. 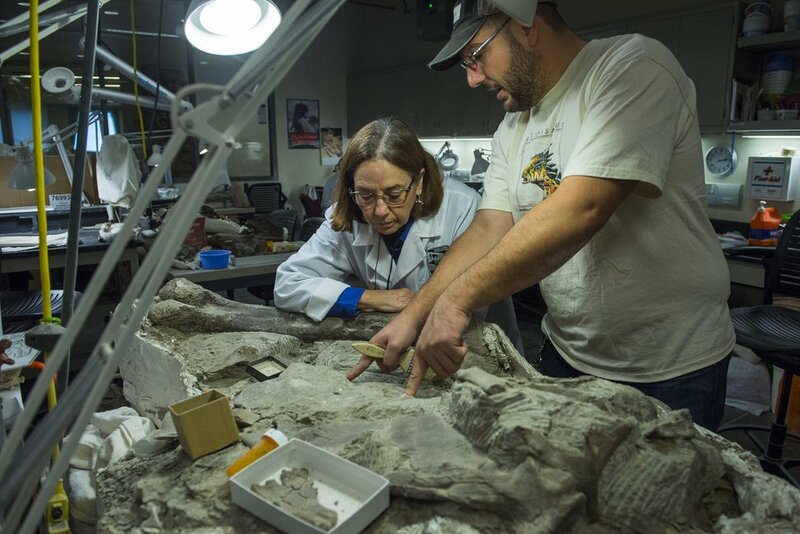 (Chris Detrick | The Salt Lake Tribune) Fossil Preparation Lab Manager Tylor Birthisel and volunteer Ann Johnson work on a Tyrannosaurid skull from Grand Staircase-Escalante National Monument at the Natural History Museum of Utah Wednesday, November 29, 2017. The wilderness and paleontology societies are among the many groups suing the Interior Department seeking to restore the Grand Staircase-Escalante and Bears Ears monuments. They contend Trump overstepped his authority when he slashed the monuments designated by two Democratic predecessors, Bill Clinton and Barack Obama. Since the Grand Staircase monument’s creation in 1996, thousands of dinosaur fossils, many representing species new to science, have been pulled out of the Kaiparowits Plateau. Ornate horned skulls from various ceratopsians grace an entire wall of the Natural History Museum of Utah. These finds have advanced scientists’ understanding of the Cretaceous, a period when dinosaurs achieved their greatest degree of evolution before a stray asteroid wiped out these reptiles and most other large-bodied animals 65 million years ago. And the discoveries keep piling up. Yet, of the 2,100 scientifically significant sites that have been identified within the old monument, more than one in three are now outside the reduced monument, according to The Wilderness Society’s analysis. Also over these past two decades, hydraulic fracturing, or fracking, the practice of injecting water underground to break up geologic formations, has triggered a revolution in oil and gas production by unlocking previously unavailable liquid minerals. Deposits that industry ignored are now economically recoverable. Deposits of such energy resources are embedded in the Tropic shale formation under lands removed from the monument, according to Polly. Scientists worry industry could get its hands on these lands before anyone has a chance to see what fossils they could yield. “Fracking would be disastrous for the paleontology here. It could destroy the entire unit very quickly," said Polly, a professor of geology at Indiana University. “The mineral resources at Grand Staircase are comparatively poor, not a good trade for what could be lost." And it’s not just fossils at stake. University of Utah geologists, for example, have documented 37 natural bridges and arches “evicted” from the Staircase, and another 78 from the Bears Ears monument. And a new report, commissioned by Western Resource Advocates, details ecological resources found on lands removed from the monuments. These reports will not only influence how the monuments’ management plans shake out, but also they will likely be deployed in the legal battler over whether Trump had any business shrinking these preserves in the first place.